Resources, musings, and encouragement for ordinary life and extraordinary lives. She said they were the best $40 she ever spent. I told her to watch for crocs sales online...wish I had her email because I'd alert her to this! I just picked up another pair in a neutral color for $26 (and its always free shipping at 6pm.com!) I found the size to be accurate. There are MANY other styles, so I am grabbing a pair of flip flops for $15 . 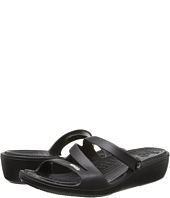 It's funny because as much as I dislike sneakers, I also dislike crocs...but these sandals are a whole other story! I have worn them all over for travel and shopping. Don't miss the free bowling this summer! Mom of four daughters, all special, two with special needs. Wife, daughter,friend, coupon clipper, hostess to a mom's support group, teacher of a preschool music class, and mostly a receiver of God's grace. Holder of a degree in elementary and early childhood. And once, long ago, completer of a two year correspondance course on interior decorating.